1 Prof. Jones: This reminds me of a chap who emigrated from Zagreb to my university just after the Great War. Used to ferry people around in his sidecar all the time. 2 Prof. Jones: Until one time when a new student from Belgrade requested a ride. Turned him down flat. 3 Prof. Jones: When I asked why, he said he hated people from Belgrade. 4 Minnesota Jones: A touch aserbic, was he? 4 Prof. Jones: That's what I said! The history and politics of Croatia and Serbia are far too tangled for me to go into here. My impressions of these two countries and their cultures are unfortunately coloured by having grown up attending a school which had students from migrant populations from both Serbia and Croatia - although at that time the nations were uneasily united into the short-lived and ultimately doomed entity known as Yugoslavia. I distinctly recall, as a young teenager, wondering how two groups of people could possibly hate each other so vehemently, and for no apparent reason other than that their parents had taught them to hate the other group. It was particularly ridiculous in that many of the children had been born in Australia and had no first-hand knowledge of what life was like in Balkan Europe at all. Sometimes I feel that our long-term cultural memories and the passing of knowledge from parent to child is holding us back from our growth as a united species. Passing grudges on to younger generations merely guarantees that they too will live in misery and violence. On a different topic, I'm expecting large royalty payments from Lucasfilm soon. That's two you owe me, George. 2019-03-10 Rerun commentary: If I was overly cynical, I might add that it serbs them right. Interestingly, "Piazza del Popolo" means "Square of the People" in modern Italian but... that's not how the piazza got its name. 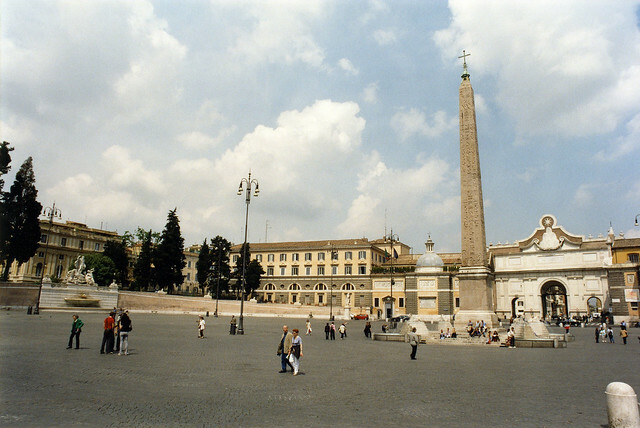 The piazza was built from 1811 to 1822, and took its name from the adjacent Church of Santa Maria del Popolo. The current church was built from 1472 to 1477, on the site of an older medieval church which had the same name. In Medieval Latin, the word populus refers to a rural parish, so the church would have effectively been called "Saint Mary's Parish Church". However, there is a competing theory that the church was named after nearby poplar trees, because - wait for it - the Medieval Latin word for "poplar" is pōpulus. If this is the case, then the church would have been "Saint Mary's Church of the Poplars". So, although "Piazza del Popolo" means "Square of the People" in modern Italian, it was actually named after either a rural parish, or poplar trees. Choose your own reality.